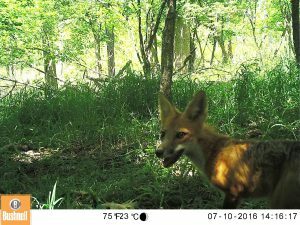 Image of a red fox caught on one of the wildlife cameras. For most of our existence, humans have lived in rural, natural places. However, more and more people continue to move into cities and urban areas. The year 2008 marked the first time ever in human history that the majority of people on the planet lived in cities. The movement of humans from rural areas to cities has two important effects. First, the demand that people place on the environment is becoming very intense in certain spots. Second, for many people, the city is becoming the main place where they experience nature and interact with wildlife on a regular basis. Remington and Grant are city-dwellers and have been their entire lives. Remington grew up in Tulsa, Oklahoma and Grant is from Cleveland, Ohio. In Tulsa, Remington fell in love with nature while running on the trails of city parks during cross country and track practices. Grant developed a love for nature while fishing and hiking in the Cleveland Metroparks in Ohio. These experiences led them to study wildlife found in urban environments because they believe that cities can be places where both humans and wildlife thrive. However, to make this belief a reality, scientists must understand how wildlife are using habitats within a city. This knowledge will provide land managers the information they need to create park systems that support all types of species. However, almost all research done on wildlife takes place in natural areas, like national parks, so there is currently very little known about wildlife habits in urban areas. 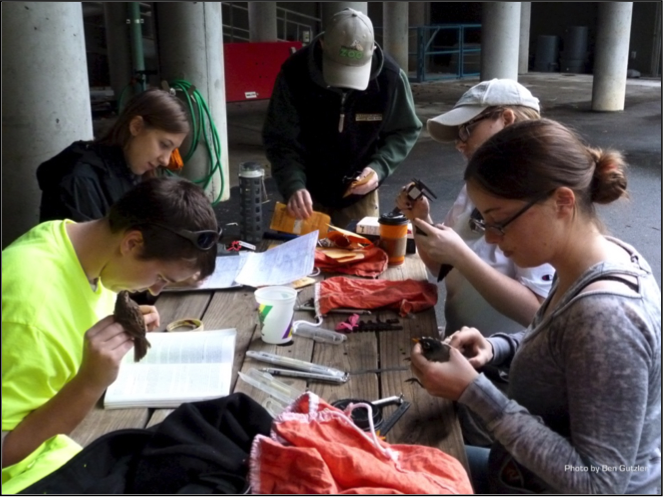 To address this gap in knowledge, Remington, Grant, and their colleagues conduct ecological research on the urban wildlife populations in the Cleveland Metroparks. Remington prepares to attach the camera to a buckeye tree. He secures them with a heavy-duty lock to keep the cameras safe from theft by people using the parks. The Cleveland Metroparks are a collection of wooded areas that range in size, usage, and maintenance. Some are highly used small parks with mowed grass, while others are large, rural parks with thousands of acres of forest and miles of winding trails. As they began studying the Metroparks, they noticed the parks were like little “islands” of wildlife habitat within a large “sea” of buildings, pavement, houses and people. This reminded Remington and Grant of a fundamental theory in ecology: the theory of island biogeography. This theory has two components: size and isolation of islands. The first predicts that larger islands will have higher biodiversity because there are more resources and space to support more wildlife than smaller areas. The second is that islands farther away from the mainland will have lower biodiversity because more isolated islands are harder for wildlife to reach. Remington and Grant wondered if they could address this first component in the wide variety of areas that are part of the Cleveland Metroparks. If the theory holds for the Metroparks, it could help them to figure out where most species live in the park system and help managers better maximize biodiversity. It would also provide an important link between ecological research conducted in natural areas and urban ecology. To evaluate whether the theory of island biogeography holds true in urban areas, Remington and Grant set up 104 wildlife cameras throughout the parks. These cameras photograph animals when triggered by motion. They used these photographs to identify the locations of wildlife in the parks and to get a count of how many individuals there are, known as their abundance. With these data, they tested whether the size of the park would influence biodiversity as predicted by the theory of island biogeography. One challenge with measuring “biodiversity” is that it means different things to different people. Remington and Grant looked at two common measurements of biodiversity. First, species richness, which is the number of different species observed in each park. Second, they calculated the Shannon Wiener Index of biodiversity for each park. This index incorporates both species richness and species evenness. Species evenness tells us whether the abundances of each species are similar, or if one type is most common and the others are rare. Evenness is important because it tells you whether a park has lots of animals from many different species or if most animals are from a single species. If a park has greater evenness of species, the Shannon-Wiener index will be higher. Remington and Grant have made their data available for use in classrooms. If you would like to have your students work with raw data, it can be used to calculate the Shannon Wiener Index, or explore other aspects of species richness and evenness in the parks. This data is not yet published, so keep in mind this data is intended only for classroom use. Download the Excel file here! PowerPoint slideshow of images from the wildlife cameras in the Cleveland Metroparks. Citizen science Zooniverse site where students can view data and identify species from Remington and Grant’s cameras. A description of the research taking place in the Cleveland Metroparks on their lab website. For more background on the importance of biodiversity, students can eat this article in The Guardian – What is biodiversity and why does it matter to us? 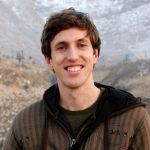 About Remington: Remington is a Ph.D. student and NSF Graduate Research Fellow at Michigan State University in Dr. Bob Montgomery’s lab. Prior to Michigan State, Remington received B.S. and M.S. degrees from the University of Missouri, where he worked with Dr. Josh Millspaugh. Following his M.S., he spent time in Amman, Jordan doing work with the Royal Society for the Conservation of Nature and spent three years teaching high school biology, chemistry, and theology at the Beirut Baptist School in Lebanon. 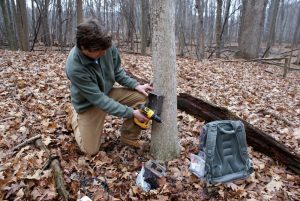 He uses cutting-edge technologies such as GPS collars and camera-traps to study predator-prey interactions between large carnivores and their prey. He is particularly excited about evaluating how ecological theory developed in “natural” areas like national parks applies to urban contexts. Remington grew up in the city and fell in love with nature and ecology in city parks. Although it carries substantial challenges, Remington believes that humans and large predators can peaceably coexist, even in and around cities. It is his goal to use the lessons learned in his research to help make that belief a reality. 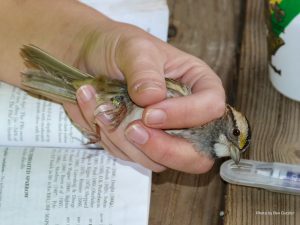 A white-throated sparrow caught during the experiment. You can see the band on it’s leg, used to make sure they did not record the same bird more than once. Glass makes for a great windowpane because you can see right through it. However, the fact that windows are see-through makes them very dangerous for birds. Have you ever accidentally run into a glass door or been confused by a tall mirror in a restaurant? Just like people, birds can mistake a see-through window or a mirrored pane for an opening to fly through or a place to get food and will accidentally fly into them. These window collisions can hurt the bird or even kill it. Window collisions kill nearly one billion birds every year! Urban areas, with a lot of houses and stores, have a lot of windows. Resident birds that live in the area may get to know these buildings well and may learn to avoid the windows. However, not all the birds in an area live there year-round. There are also migrant birds that fly through urban areas during their seasonal migrations. In the fall, for example, migrant birds use gardens and parks in urban areas to rest along their journeys to their winter southern homes. During the fall migration, people have noticed that it seems like more birds fly into windows. This may be because migrant birds, especially the ones born that summer, are not familiar with the local buildings. While looking for food and places to sleep, migrant birds might have more trouble identifying windows and fly into them more often. However, it could also be that there are simply more window collisions in the fall because there are more birds in the area when migrant and resident birds co-occur in urban areas. Researchers identify the species of each bird caught in one of the nets used in the study. They then place a metal bracelet on one leg so they will know if they catch the same bird again. Natasha was visiting a friend who worked at a zoo when he told her about a problem they were having. For a few weeks in the fall, they would find dead birds under the windows, more than they would during the rest of the year. He wanted to figure out a way to prevent birds from hitting the exhibit windows. Natasha became interested in learning whether migrant birds were more likely to fly into windows than resident birds or if the number of window collisions only increase in the fall because there are a lot of birds around. To do this she would have to count the total number of birds in the area and also the total number of birds that were killed in window collisions, as well as identify the types of birds. To count the total number of birds in the area, Natasha hung nets that were about the same height as windows. 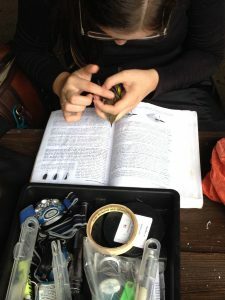 When the birds got caught in the nets, Natasha could count and identify them. These data could then be used to calculate the proportion of migrants and residents flying at window-height. She put 10 nets up once a week for four hours, over the course of three months, and checked them every 15 minutes for any birds that got caught. Researcher identifying a yellow-rumped warbler, one of the birds captured in the net as part of the study. Then, she also checked under the windows in the same area to see what birds were killed from window collisions. She checked the windows every morning and evening for the three months of the study. Different species of birds are migratory or resident in the area where Natasha did her study. Each bird caught in nets was examined to identify its to species using its feathers, which would tell her whether the bird was a migrant or a resident. The same was done for birds found dead below windows. If window collisions are really more dangerous for migrants, she predicted that a higher proportion of migrants would fly into windows than were caught in the nets. But, if window collisions were in the same proportion as the birds caught in the nets, she would have evidence that windows were just as dangerous for resident birds as for migrants. Sabo, A.M., Hagemeyer, N.D.G., Lahey, A.S., and E.L. Walters. 2016. Local avian density influences risk of mortality from window strikes. 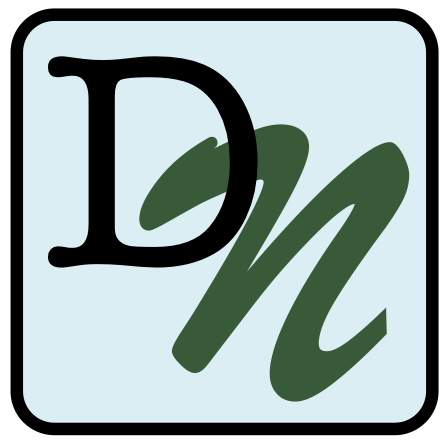 PeerJ 4:e2170; DOI 10.7717/peerj.2170. Lizards, Iguanas, and Snakes! Oh My! Throughout history people have settled mainly along rivers and streams. Easy access to water provides resources to support many people living in one area. In the United States today, people have settled along 70% of rivers. Today, rivers are very different from what they were like before people settled near them. The land surrounding these rivers, called riparian habitats, has been transformed into land for farming, businesses, or housing for people. This urbanization has caused the loss of green spaces that provide valuable services, such as water filtration, species diversity, and a connection to nature for people living in cities. Today, people are trying to restore green spaces along the river to bring back these services. Restoration of disturbed riparian habitats will hopefully bring back native species and all the other benefits these habitats provide. 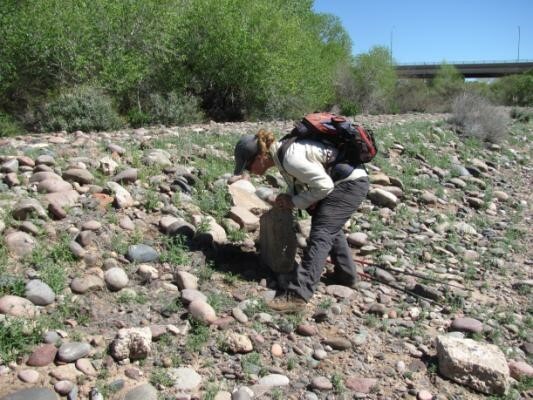 Scientist Mélanie searching for reptiles in the Central Arizona-Phoenix LTER. Scientists Heather and Mélanie are researchers with the Central Arizona-Phoenix Long-Term Ecological Research (CAP LTER) project. They want to know how restoration will affect animals living near rivers. They are particularly interested in reptiles, such as lizards. Reptiles play important roles in riparian habitats. Reptiles help energy flow and nutrient cycling. This means that if reptiles live in restored riparian habitats, they could increase the long-term health of those habitats. Reptiles can also offer clues about the condition of an ecosystem. Areas where reptiles are found are usually in better condition than areas where reptiles do not live. Heather and Mélanie wanted to look at how disturbances in riparian habitats affected reptiles. They wanted to know if reptile abundance (number of individuals) and diversity (number of species) would be different in areas that were more developed. 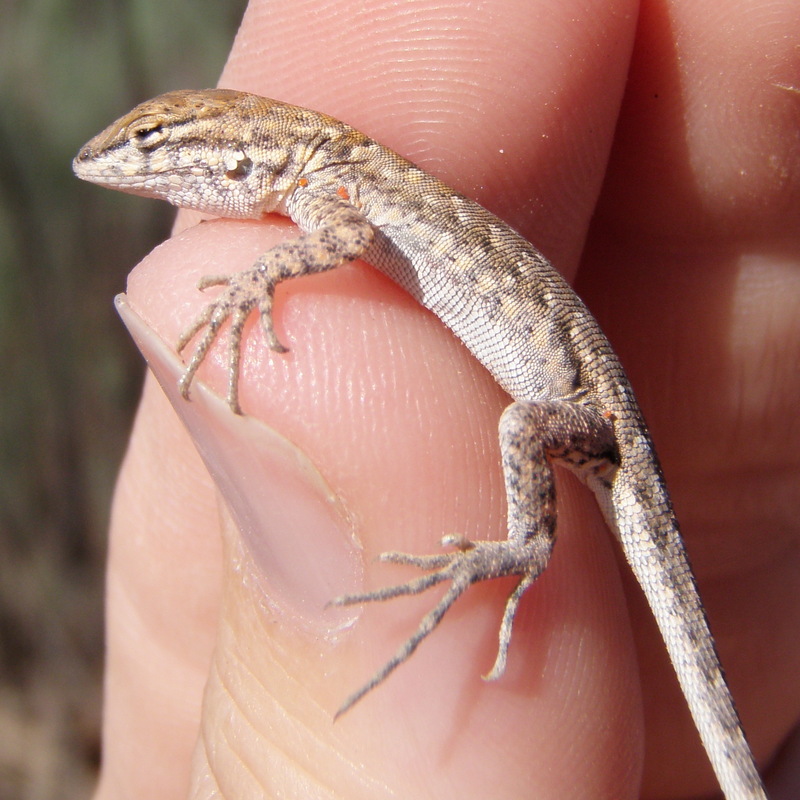 Some reptile species may be sensitive to urbanization, but if these habitats are restored their diversity and abundance might increase or return to pre-urbanization levels. The scientists collected data along the Salt River in Arizona. They had three sites: 1) a non-urban site, 2) an urban disturbed site, and 3) an urban rehabilitated site. They counted reptiles that they saw during a survey. At each site, they searched 21 plots that were 10 meters wide and 20 meters long. The sites were located along 7 transects, or paths measured out to collect data. Transects were laid out along the riparian habitat of the stream and there were 3 plots per transect. Each plot was surveyed 5 times. They searched for animals on the ground, under rocks, and in trees and shrubs. Featured scientists: Heather Bateman and Mélanie Banville from Arizona State University. Written by Monica Elser from Arizona State University. Meet the scientist! Click here to watch a video where scientist Heather explains her research!